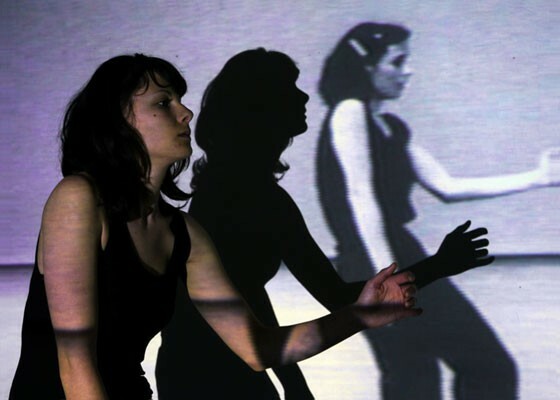 A.Trio is a video installation that inserts itself into the protracted history of Yvonne Rainer’s most famous dance piece, Trio A. Rainer began working on Trio A in 1965 to be performed as part of The Mind Is A Muscle, Part 1 at the Judson Church in 1966. She invited three dancers to perform the same sequence of movements at their own pace allowing them to come in and out of unison. This sequence of movements was groundbreaking in its disregard for genre, dynamic phrasing, and emotional affect – all standards of quality at the time. Trio A would become Rainer’s signature, a canvas upon which to create new works. In Convalescent Piece, Rainer feebly performed the movements from Trio A while in recovery from surgery. She adapted the same movements to suit the conditions for another piece titled War involving 30 dancers wearing nothing but American flags around their necks. There is no true original version of Trio A. It has been performed by different bodies in various arrangements, orchestrated by Rainer and others, a multitude of times. One could cite the parenthetical second half of Lawrence Weiner’s Declaration of Intent: “Each being equal and consistent with the intent of the artist, the decision as to condition rests with the receiver upon the occasion of receivership,” although Rainer would probably maintain that the decision as to condition rests with the creator upon the occasion of receivership. In celebration of the multifaceted life of Trio A, Rainer endeavored to teach the piece to performers directly, rather than through the use of photographic documentation, to better explain the nuances of the choreography and avoid focusing on the exact implementation of Trio A in that documented instance. In doing so Trio A came to encompass more than the collected lineage of a single dance, but also a process of passing along a malleable, yet specific work. I learned Trio A by watching 1978 film documentation that has been uploaded to YouTube. The film, which has become the definitive documentation of the work, shows Rainer performing the dance alone in a studio followed by close-up shots of some of the subtler movements. I invited a dancer to learn the piece from the same video and asked her to perform it in unison, as closely as possible, with a video projection of the 1978 film. My version titled A.Trio echoes and, in effect, reverses the original work by Rainer. It demands a unified trio, meditated through time and space, to be performed by Yvonne Rainer, a dancer, and the dancer’s shadow. Also see documentation of the related performance Variations.